Surprise: I set out my tomato plants last evening. The plants were growing so fast I had to transplant them into our garden five days before I originally planned. In earlier Tomato Patch postings, I explained that I had planted the seeds indoors on April 25 and planned to transplant them into the garden on Memorial Day, exactly five weeks after I dropped the seeds into the cups in which they grew under fluorescent lights in our basement utility room. On May 20, I moved the plants outside to harden off—to get used to life outdoors—gradually increasing their daily dose of direct sunlight. But the last week has been extra warm—both days and nights—and the plants grew about an inch a day. By Tuesday it was obvious I had to transplant them soon. By Memorial Day the plants would be “leggy” or “spindly” and would take extra care in planting. Because our garden actually consists of many small squares and rectangles, most semi-terraced, near the top of a hill, I use simple hand tools for my gardening work. The first photo shows what I used for this job. I worked in the evening to spare the young plants a double shock—the transplanting itself plus a whole day in today’s sunshine with a predicted temperature of 90°. 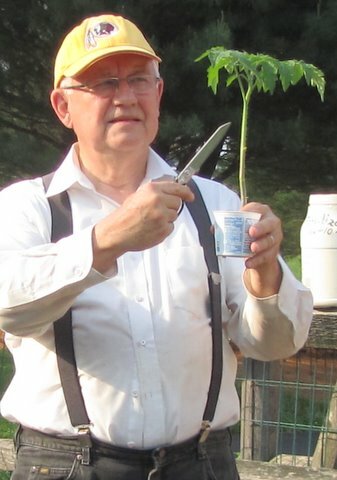 My most important transplanting tool is a warren hoe, which has a triangular blade. (Look for its bluish blade in the right corner of the photo.) I use that hoe as a plow to loosen up the soil where I plant my veggies, to make a deep furrow for the plants, and then to hill the soil back up around the plants. Power for the warren hoe comes primarily from my arms. Experience has taught me that using the hoe to till is easier on my old back than digging and turning the soil with a shovel, spade, or garden fork. I also use an old mop handle to space the transplants. The wooden handle just happened to be 48” long, and I nicked it with a saw every 12”, and I use it to space the plants every 2½ or 3 feet in the first row of a planting area. Over the years I’ve left several metal tape measurers outside to rust in the dew or rain, but it’s pretty hard to overlook a yellow measuring stick. 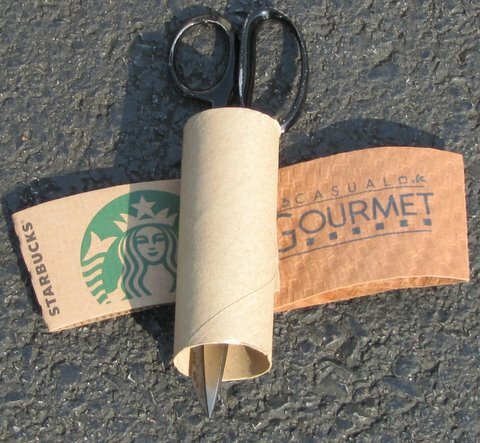 I use scissors to cut off lower leaves of each plant so I cover the lower 2 or 3 inches of the stems with the garden soil. The seedlings will put out roots where soil covers the stems and will help the plants grow and fruit vigorously over the next few months. I use the warren hoe to plow the row areas. I no longer turn over every inch of the garden—just the areas where the plants will grow. If I plow and don’t plant, something will grow in the tilled but unused areas—things called weeds. After I through the basic plowing, I use the warren hoe to make furrows about 8” deep. I sprinkle pelletized dolomitic lime and fertilizer into the furrows and mix them lightly into the soil with the hoe. Then I place plants 2½ or 3 feet apart, using the mop handle for spacing plants in the first row. Then I use the warren hoe to pull just a little soil around the root balls of the transplants, to stabilize them while I use the hose to dribble water around the root ball of each plant. Why the water at this point? I add the water to make sure the lime that I sprinkled in the planting trench is damp and can begin to dissolve. Lack of calcium causes blossom-end rot in tomatoes. 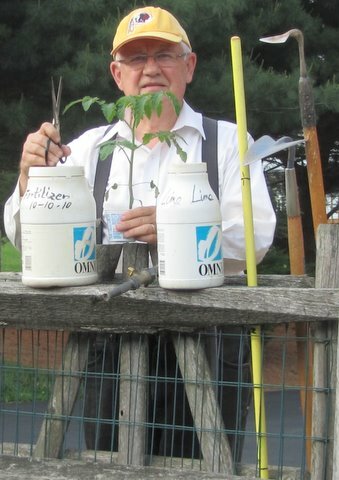 I try to minimize that problem by making sure my young plants have an available calcium source—the lime—as they begin to grow in the garden. And note that I “dribble” water around the plants. 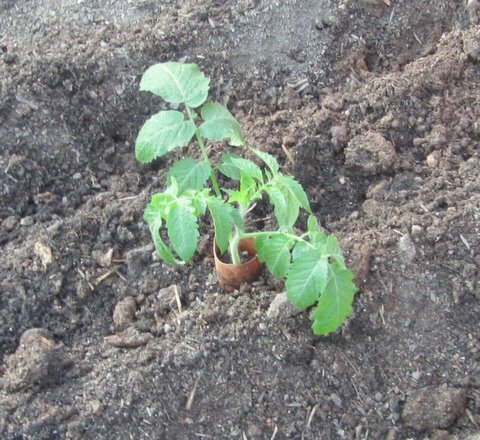 Lots of pathogens are endemic in garden soils just waiting to splash onto tomato leaves and begin the process that can eventually kill the plants. I’ll watch the weather forecasts closely so I mulch the young plants before we get an afternoon downpour that coats the lower leaves with garden soil—and pathogens. The fertilizer I use is a typical 10-10-10 formula that I bought in a bag at a big-box store. I use just a sprinkle, as I added compost to the garden in late winter. I’ll add another sprinkle along the rows just before I mulch, and that will be it as far as fertilizer is concerned. After I wet the plants, I use the warren hoe to complete the initial hilling process, and then I use pieces of toilet-paper rolls or coffee-cup insulators to wrap around each of the stems, installing the tubes so they’re roughly an inch below and above ground. This is a simple precaution that prevents cutworms (larva of a moth) from wrapping around the stems just below soil level and cutting off the young plants, sometimes as efficiently as a chainsaw would do the job. And then I dribble water around each plant a second time. Job done. Put tools away. Two hours. 23 plants: 2 Defiant, 2 Virginia Sweets, 1 Wow!, 3 Sungold, 2 Juliet, 1 Big Mama, 3 Super San Marzano, 3 Brandywine (Sudduth’s), 3 Brandywine Red, and 3 Yellow Plum. I’ll tell you more about the different varieties as the season progresses. As I was transplanting, I realized I forgot to start seeds of one of my favorite variety, Celebrity. Oh, well, there’s always next year. And what happened to all the other plants that I started? I gave most of them away to other tomato growers. And I have five left as potential replacements if disaster strikes during the next week or 10 days. And, oh, yes, this morning I planted one of the extras in an unfenced perennial flower bed—and sprayed it with Deer Out, the repellent I’m experimenting with this year. Gardeners in Deer Country know that bambits love tomato plants, and just about every other veggie you can think of.